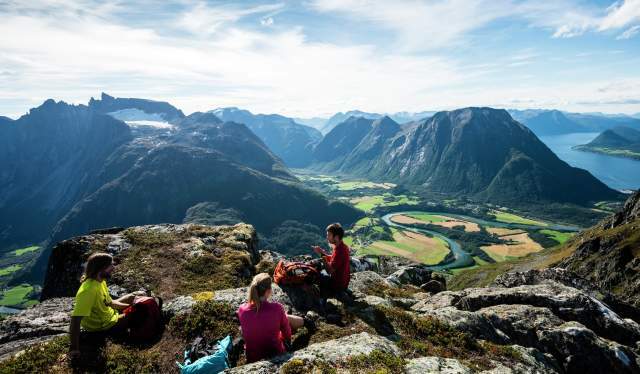 This breezy hike offers a panoramic view of some of the most impressive mountains in Fjord Norway, and has a spot on The Norwegian Trekking Association’s list of the most popular mountain hikes in Norway. The 10-kilometre long hike across the Romsdalseggen ridge is 1,329 metres above sea level at its peak, but can be adapted to suit various abilities. “The special thing about Romsdalseggen is that it offers views and experiences throughout the hike. You will not just be going from one point to another to experience something there. The experience and the wow-sensation is with you the whole time”, says Hilde Gråberg Bakke, Romsdal Reiseliv & Handel. In just a few years, the hike has become a huge attraction. Romsdalstrappa makes the popular hike easier, but also more dazzling. Romsdalstrappa is a set of stairs that forms a continuation of the Romsdalseggen ridge along the Nesaksla mountain. Along these stairs you will find the wonderful lookout point Rampestreken. Rampestreken is a 20-metre long steel ramp – or photography ramp – of which 8 metres seem to hang in thin air. At this point, you are 565 metres above the alpine town of Åndalsnes, which is just an hour’s drive from Molde. At the very tip of the ramp, only a grate supports the people who dare to walk to the edge. The view takes most people’s breath away. “Butterflies in the stomach, mighty, breezy, and amazing” are some of the reactions from hikers who have stood at the edge of the ramp. The hike across Romsdalseggen is 10 kilometres long, and the height difference is about 970 metres. It’s airy, but a breathtaking experience standing on the top of the ridge. The path is well marked, and the ground is solid. Some parts of the hike are exposed and can be scary to some people. You don’t need climbing gear, but there are chains bolted in at the steepest parts for a better grip. People with a mild degree of fear of heights will, with a good companion to lean on, manage to get through the toughest part of the hike. This hike is not for everybody, and you should consider if you have enough mountain experience before you embark on a trip over Romsdalseggen. Children should be used to hiking longer distances in rough terrain. The Romsdalseggen ridge hike is not suitable for pre-school children. Wear proper clothing and good hiking shoes, and bring a set of warm clothes and plenty of food and drink – maybe even a couple of chocolate bars. Update yourself about the latest weather forecast before you start your hike. In cases of dense fog or low clouds, strong wind in combination with rain, low temperatures, or thunderstorms, choose a different day for hiking Romsdalseggen.